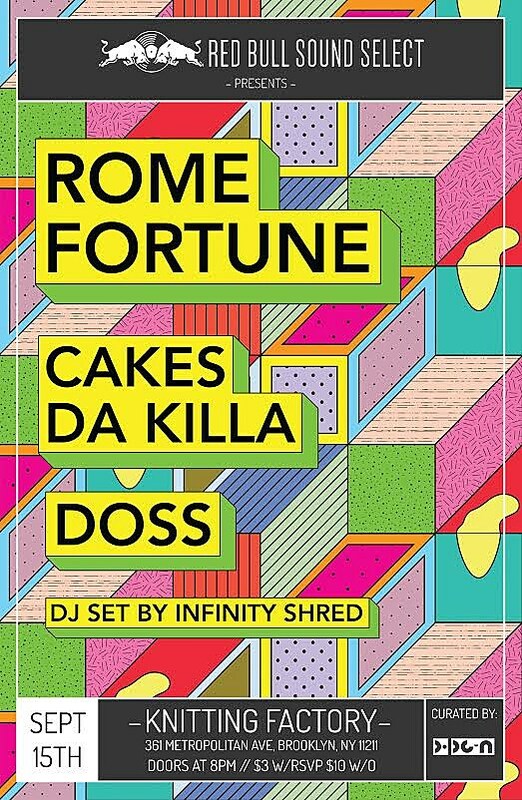 Atlanta’s green-bearded rapper Rome Fortune is touring soon and playing the next Red Bull Sound Select installment in NYC. This one’s curated by PopGun and also includes local rapper Cakes Da Killa and Doss. It goes down Tuesday (9/15) at Knitting Factory. Like most RBSS shows, it’s $3 with RSVP or $10 without, though entry is first come first served even if you RSVP. All dates are listed below. Cakes also played the last RBSS show in the area which was in Asbury Park and a BrooklynVegan-curated show with Against Me! and Big Eyes. Check out our review and pictures of that one HERE. Rome Fortune’s list of collaborators includes Toro y Moi (who is touring soon) and Four Tet (who also has shows coming up).